Cruising for a good time? Isn’t this photo a beaut? I’ve been saving it for a while. Tony Beresford, a member of my Windsor Ontario Then facebook group, posted it several months ago but unfortunately, didn’t have much information to go with it. 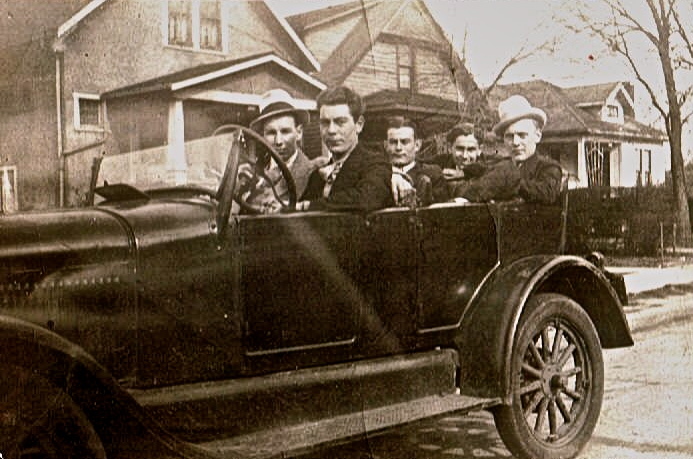 At least he knows who a couple of the fellows are: Jack (Red) Beresford is at the wheel, and sitting in the middle is his brother Ken Beresford. Ken was Tony’s grandfather and father-in-law to Tony’s mother Shirley who thinks this photo may was taken on Grove possibly near Church Street, an area close to downtown Windsor. And that’s all they know. Looking at their sharp duds, I would say they’re about to take a cruise down Ouellette Avenue to one of the hotels to meet some ladies, or they’re on their way to a wedding. Or maybe they’re going to board a ferry to head over to Detroit to try their luck with some American gals. Since practically everyone in Windsor knows someone who knows someone who knows someone, that someone may have clues about this photo. Make Tony and Shirley happy by posting them below this story. This entry was posted in Fashion, People, The Straits, Windsor Now, Windsor Then and tagged 1920s, cruising, Detroit, Detroit River, downtown, duds, fashion, ferry, gals, gents, history, hotel, ladies, mystery, Ontario, Ouellette Avenue, photo, photography, Roaring Twenties, sharp, streets, style, urban, vintage, wedding, Windsor. Bookmark the permalink. What a great photo. I love these old ones, and imagining the lives behind them. Thanks for sharing!